I successfully added a TinyMCE stylesheet using add_editor_style() so that I can preview the styles in the body of the TinyMCE editor. However, am I right in assuming that the add_editor_style() function can only access style for the body of the editor? If so, is there another method or function that I can use to access the styling of the TinyMCE Format dropdown as well? You can not enhance the drop down list formatselect. But you can enhance with the hook tiny_mce_before_init the second drop down styleselect, there is hide in a default WordPress install. The documentation list all defaults and possibilities. selector – CSS 3 selector pattern to find elements within the selection by. This can be used to apply classes to specific elements or complex things like odd rows in a table. classes – Space separated list of classes to apply the the selected elements or the new inline/block element. styles – Name/value object with CSS tyle items to apply such as color etc. exact – Disables the merge similar styles feature when used. This is needed for some CSS inheritance issues such as text-decoration for underline/strikethough. 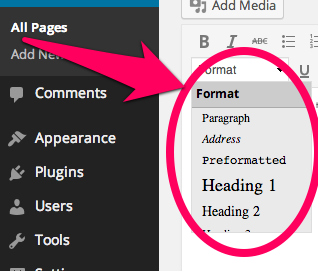 Note that, by default, the Style dropdown is hidden in WordPress. At first add the button for custom formats to a menu bar of TinyMCE, in example line 2 with hook mce_buttons_2. Then enhance the drop down of this button. Aslo useful the enancement via additional value in the array, see the codex for this example. You can also enhance the drop down with a tree menu. Create the var from the example source above with more structure in the array, like the follow source. Now is the last point, that you include the custom css for this formats, via hook mce_css. Don't forget to add this stylesheet rules also to the front end stylesheet. As enhancement you can remove the formatselect drop down button via check for the value in the button array. Add the follow source to the function fb_mce_editor_buttons at the hook mce_buttons_2. Not the answer you're looking for? Browse other questions tagged css tinymce or ask your own question. How to use a TinyMCE filter? 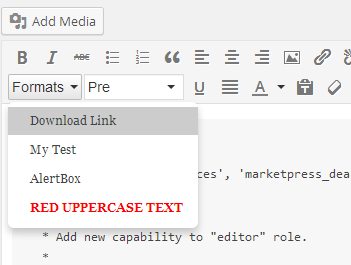 How to add a class to ul tags created by the WordPress editor Tinymce?